The Royal Quiet DeLuxe puts you right in touch with literary history -- it was one of Ernest Hemingway's favorite machines. This was the first model in a series of the Royal Quiet DeLuxe line that outsold any other portables of the time. It was introduced just before World War II, but its production was suspended when Royal Typewriter Company, like other typewriter manufacturers in the United States at the time, was converted to an ordnance factory to produce weapons. When production resumed in 1946, the Royal Quiet DeLuxe continued to gain a following among on-the-go writers and journalists. 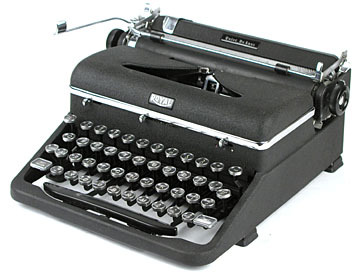 Compact, snazzy and a pleasure to write with, this workhorse model is also one of myTypewriter.com's bestsellers.